Adding Cereal to Your Baby’s Bottle – Is Adding Cereal to Baby’s Bottle Safe? Will Cereal in Baby’s Bottle help her to sleep longer? We know that many parents, tired and at their wits end from lack of sleep, are offered the advice of putting cereal in baby’s bottle so that baby might sleep for a longer period of time. We know that many are probably tempted to try the old “cereal in the bottle” trick to gain an extra 1 hour (heck even an extra 20 minutes.) of sleep. We also know that this is one of the biggest and possibly one of the more dangerous practices you could engage in. It is not a good idea because you may throw the “I’m full” instinct off kilter; more importantly, babies have been known to aspirate cereal when cereal is mixed in a bottle with formula or breast milk. 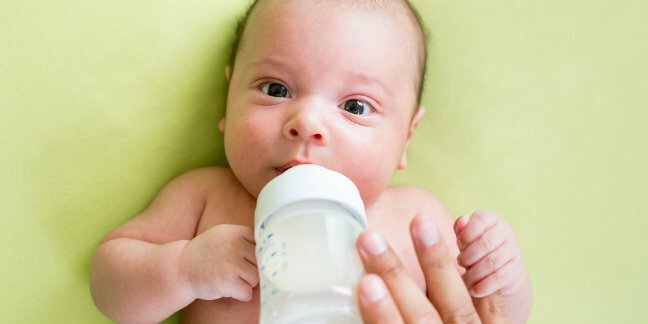 Babies who are younger than 4-6 months old seldom know how to properly swallow anything other than breast milk or formula and gulping or “inhaling” a bottle with cereal in it may have deadly consequences. Why does it seem that adding cereal to a bottle makes a baby sleep longer? As my pediatrician explained, about the time parents begin to try the cereal in the bottle trick is just about the time that an infant may be sleeping for longer periods at a time. This new. longer sleeping pattern is a natural progression as baby ages and it oftentimes coincides with the addition of cereal to the bottle. This coincidence perpetuates the dangerous myth that cereal in a bottle does indeed help an infant sleep through the night. To further this explanation, let us recall that between 6-8 months old, baby is often back to waking at night for a feeding. By this time baby should be eating solids and it appears that those solids are no longer helping baby sleep through the night. In reality, baby is hitting another growth spurt and may wake again during the night for more feedings regardless of eating solids. Infant sleep and bedtime cereal – Macknin ML, Medendorp SV, Maier MC. Department of Pediatrics, Cleveland Clinic Foundation, OH 44195-5045. We studied whether feeding infants rice cereal before bedtime promotes their sleeping through the night. One hundred six infants were randomly assigned to begin bedtime cereal feeding (1 tablespoon per ounce in a bottle) at 5 weeks or at 4 months of age. Caretakers recorded the infant’s sleep from age 4 to 21 weeks for one 24-hour period per week. Sleeping through the night was defined as sleeping at least 8 consecutive hours, with the majority of time being between the hours of midnight and 6 AM. The results were also reviewed changing the requirement from 8 hours to 6 hours. Should I put cereal in the bottle to help my baby sleep through the night? Q: Will cereal in the bottle before bed help my baby sleep through the night? Does feeding before bed help a baby sleep through the night? First: No, it is usually a bad idea to put cereal in the bottle before bed. This may lad to children waking up at night with gas and stools. It may also lead to a baby learning to become dependant on having a “full belly” to fall asleep. Also, cereal is only “empty calories” for babies under 4 to 6 months old, with little nutritional value except in older babies. Does adding cereal to a baby’s formula help them sleep through the night?